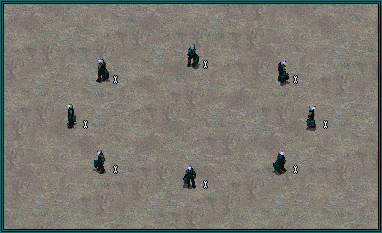 One thing is clear, and it is a vital piece of information that gives Foehn's enemies a huge advantage - the Foehn Revolt is limited in numbers. The amount of its troops, technicians and scientists is limited and thus every single life counts. This is why even the most basic of Foehn soldiers who fight on the frontlines have been given an advanced set of equipment that is supposed to increase their durability and survivability on the battlefield. The Knightframe is the foundation of a Foehn infantry battallion. These troops walk through the battlefield in a mechanical frame which allows them to walk faster but will also help the men inside endure the harshest situations. 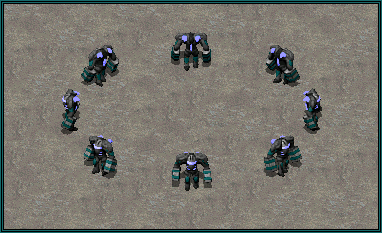 A very heavy machine gun has been mounted into each of these powersuits, a weapon effective both against ground and flying targets, but mostly against troops and the lightly armoured units. Unique design of the powersuit allows the Knightframe to enter garrisonable buildings if need be as it'll fold into a more compact version as they do so. They will however not be able to shoot at aircraft from a building. 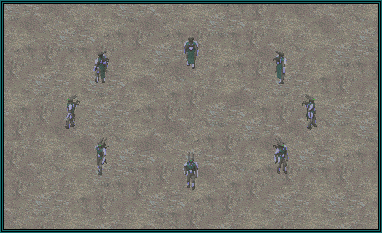 Starting infantry unit for Foehn. Vulnerable to EMP and magnetic weapons. Once a dose of nanofibers from the Nanofiber Loom has been applied to a Knightframe, it grows bigger and stronger, becoming a Kingsframe. An unfortunate and negative consequence of this transformation is that the Kingsframe powersuit loses its adaptability and can no longer fit into garrisonable buildings, making it incapable of shooting from one. However, the Kingsframe is more resistant to damage than the Knightframe and does not require shelter from EMP, or from large units like the Battle Tortoise which can roll over most of infantry. 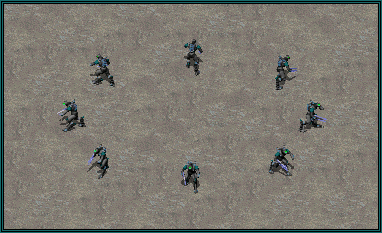 These soldiers will march bravely at the enemy base and use their newly acquired power cannon to demolish buildings and eliminate groups of enemy troops in seconds. Keep in mind that this weapon cannot be fired at enemy aircraft, so think twice before transforming your entire squad of Knightframes. Fast and relentless, the Foehn Revolt's Lancer is a soldier who comes from one of two groups: some are survivors who believed that replacing their limbs with cybernetical copies will increase their chances of survival in the fight against those who pull the strings from the shadows, others are those who already faced their fated enemy and lost, but even when heavily damaged, refused to give up the fight. The Lancers will run straight towards enemy tank divisions and use their unique pressure lances to smash them into pieces. 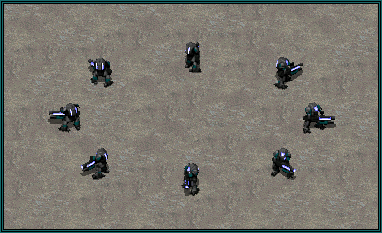 The Lancer's weapon is also very effective against enemy structures, making early hit'n'run attacks with even small groups of these troops possible and quite effective against unsuspecting enemies. They can also garrison buildings and shoot from the inside. 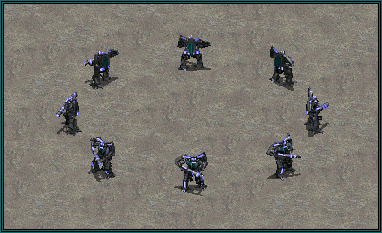 Their cybernetic nature makes Lancers immune to Dog and Spook bites, but vulnerable to EMP, so be cautious. The Lancer grows stronger when exposed to the Nanofiber Sync and becomes the Railguneer, a powerful force that tank operators will avoid at all costs. The nanofibers enhance Railguneers' cybernetic limbs, making them capable of carrying the heavy armor design which encompasses this soldier's body upon the Sync. The armor makes a Railguneer immune to getting crushed by any tank but also has self-sustainability systems which will prevent the effect of EMP weapons. Railguneer's biggest attribute however is its weapon, a personal plasma railgun which gives them an edge over the Lancers in battle: where Lancers could not reach with their short-range pressure lances, the Railguneer will fire from a distance. On the other hand, the weapon's effectiveness against structures or infantry is much lower in comparison to the Railguneer's original form. The poor Engineer did not benefit from the invention of the Nanofiber Sync and incorporation of the technology in the Foehn Revolt's arsenal, it does not acquire a second form when the Sync is applied to them. The Foehn Engineer is just like any other Engineer because that's how the world works and the world's rules are absolute. Despite that, in this world, an Engineer's role in every army is indisputable - instant repairs of friendly structures, capture of neutral or enemy buildings, defusal of bombs planted by enemy insurgents and capture of empty vehicles, these are all roles unique to an Engineer and an Engineer alone. In the wake of the unmatched war machine that is the Foehn Revolt's nanofiber-enhanced infantry divisions, the Engineer remains the important backbone of each and every one of them. 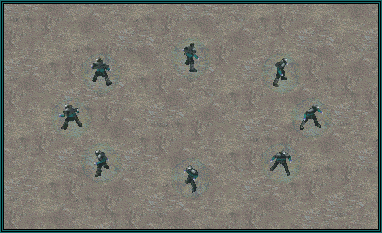 The development of Foehn's unique technologies has resulted in the creation of unorthodox strategies and combat techniques, which have not been seen employed in battle by the other factions before. A good example of this is the Huntress, who thanks to advanced weaponized nanotechnology, basically becomes a combat healer on the field. Huntress is armed with a small launcher-like gun, the part of which consists of a simple-looking container. Inside that container hides a mass of nanites, which the Huntress can control and move around to a certain extent after they've been catapulted. 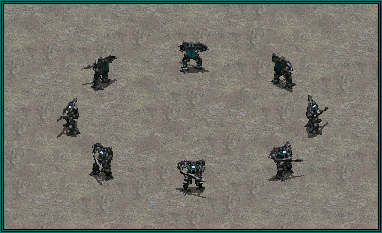 These nanomachines will aim for enemy infantry and blow them to pieces. Whatever reuseable materials are found in the killed trooper's suit or weapon will be picked up by the nanomachines, which will create a cloud which Foehn troops can enter in order to regenerate temporarily. While the Huntress cannot damage vehicles directly, she can release her nanites into an enemy vehicle at close ranges in order to clear it from any crew and then take over the vehicle for herself. Foehn infantry can briefly heal in nanoclouds created by Huntress' kills. After a Nanofiber Sync, the Huntress loses her speed but gains armor and an entirely new purpose on the battlefield. The nanites in her container are used up to form a personal version of the weapon used by the Irritators and Angelsharks: an advanced confusion ray. 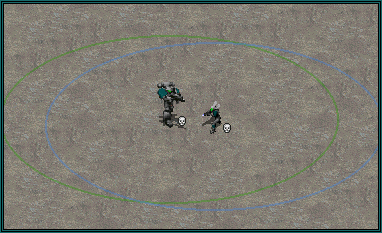 Compared to the types of confusion ray used by the other two units, Deviatress can only affect one enemy unit at a time as her rifle does not have an area of effect. She makes up for it with the weapon's long range and a unique ability to throw the flying units' crews into confusion, including the personnel onboard the mighty Kirov Airship. Deviatress has no other weapons and does not have the ability to steal vehicles unlike her original form, which is why she's used for support. The Clairvoyant is an oddball among the infiltrators, it is neither a soldier nor a spy, but a weirdly shaped drone that can benefit from the use of Spinblade with a tiny windflow drive it has mounted on its back and can traverse water zones freely. Unlike all the other of infiltrators, it cannot disguise, but its price and early availability during the battle make it ideal for a direct infiltration rush attempt with many Clairvoyants involved, as the chance is high that at least one of them will reach the target, unless the destinated building is walled or hidden behind a gate. This little drone has another trick up its sleeve: it can use a short ranged stun gun to immobilize most enemy infantry near it and will also automatically use its weapon against disguised enemy infantry once it detects them. Additionally, it is able to detect stealth units like the Epsilon's Shadow Tanks and has the ability to destroy bridges, allowing them to limit an enemy's movement on the battlefield. Immune to poison and radiation. Takes 2 slots inside a transport. Can receive speed boosts near Spinblades. The nanofibers turn Clairvoyants into little monsters, who instead of infiltrating enemy structures will begin to infiltrate.. enemy bodies. The nanomachines in a Clairvoyant's body start rapidly multiplying the moment a sync happens. This unending multiplying means they require additional resources in order to continue the process. 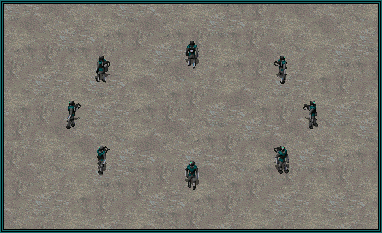 This is why they form this weird body, the Duplicant, which will crawl towards enemy infantry in order to 'devour' them and use the collected materials for multiplication. Keep in mind, that once a Duplicant performs its attack, it will temporarily disintegrate in order to take over another body, but if it fails to do so, the nanites will not be able to reassemble into a Duplicant body. One Duplicant can kill more than just one enemy soldier, so if it hits just right, a whole chain reaction might take place. The structure of a Duplicant is very different compared to that of the Clairvoyants, as it is a body that has completely been taken over by activated nanomachines. As its small devices and the windflow drive get consumed by the insatiable nanites, the Duplicant can neither cross water zones or gain speed boosts near the Spinblades. It also loses the ability to detect cloaked units and generally becomes less resistant to damage, although due to continuous multiplication of nanites in its body, it can regenerate from taken damage to an extent. The weapon does not affect Duplicant's allies' infantry. 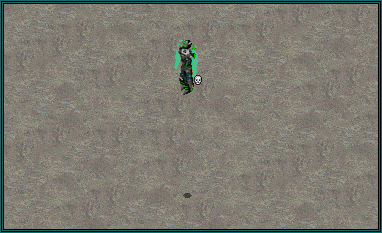 This unit is unique to Haihead. The Haihead's objective is to deal as much damage to the enemy positions in as short time as possible and move on to the next target. While not an offensive unit itself, the Syncronin ideally fits as support for the Haihead's strike forces, as it complements the weapon design choices made to push the effectiveness of the Haihead's strategy to its limits. Syncronin has a peculiar weapon in the form of an atomic-level bond breaker, which when activated and cast upon enemy structures, makes the cohesion of the materials they're built from much, much weaker. 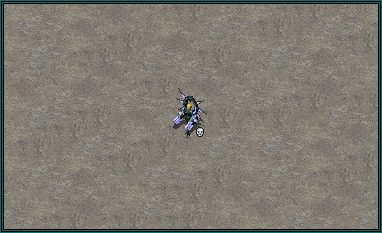 With their lowered resistance to damage, Haihead can largely decrease the time required to level enemy bases. The effects of Syncronin's bond breaker are accumulative, meaning that if more than one Syncronin fires its weapon at a building, its material cohesion will be lowered even further and the building will become even more susceptible to damage. The weapon decreases building armor by 20%. The effect is stackable. The Syncronaut is one of those transformations that does not stray away too far from the original concept, but changes the method and conditions under which the unit can perform its tasks. When the Nanofiber Sync is used on the Syncronin, the soldier acquires the ability to become undetectable by most enemy forces and defensive structures, allowing it to infiltrate bases unnoticed. The Syncronaut's bond breaker differs in use from its original form: it is not a ranged weapon anymore but instead, it can affect multiple targets at once in an area. This modification makes Syncronauts ideal for situations during which it becomes urgent to guarantee a take down of several key structures inside an enemy base with an artillery strike or some sort of a superweapon. The Syncronauts will not reveal themselves even when deploying their bond breakers, however their actions will be noticed by the enemy due to the weapon emitting a strong signal that's easy to pick up on as soon as the attack begins. Will not reveal itself when firing its weapon. 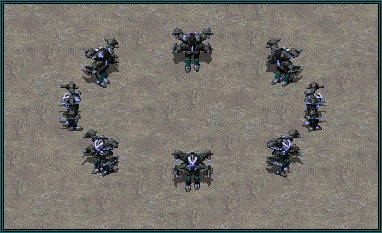 This unit is unique to Wings of Coronia. The Coronian Zorbtrotters have taken wind manipulation techniques to the extremes. It is widely believed among those who try to defeat the Foehn Revolt that their windflow manipulation technology has already been miniaturized and attached to soldiers, who are then capable of using it against the ground troops. 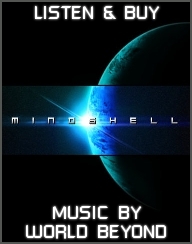 However, some among the Epsilon ranks are speculating that the powers to control the winds have manifested from within and are not enhanced by any mechanical means, in a similar fashion the Epsilon's psychics can move various objects around with their minds alone. It could just be that the Zorbtrotters are taught by those who rebelled against Yuri's army. Nevertheless, what's clear is that the Zorbtrotters are lethal to any infantry which.. needs to breathe. These soldiers of Coronia can basically deny breathable air to those who oppose them by creating temporal spheres from which oxygen is removed. Zorbtrotters also control a sphere around them, which allows them to benefit from Spinblades and also travel over water without issues. If need be, they can use their own sphere as a weapon against infantry by increasing its size for a moment and creating a vacuum. Resistant to Alanqa's hurricane weapon. 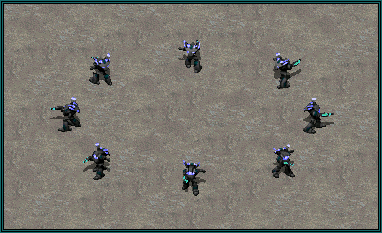 Can deploy to create a larger sphere that acts as an offensive shield against infantry. The spherical wind shield will also increase the Zorbtrotter's strength by 25% for 16 seconds. When the Zorbtrotter completes his training and is awarded with the Nanofiber Sync, he replaces his ability to temporarily create a shield with one that he passively uses all the time: an ability to use a handful of nanites within his wind orb for quick emergency regeneration. Whenever a Zorbfloater is under attack, these nanites will continuously try to reduce the negative consequences of combat and repair the damages to his suit or heal the wounds on his body. While the Zorbfloater's primary weapon does not change, these troops also gain the ability to lift lighter vehicles into the air so that their allies' anti-aircraft weapons can target and fire at them. 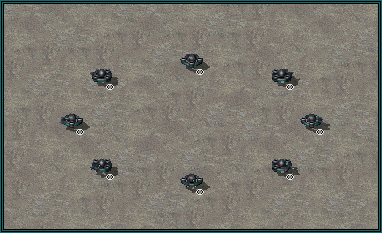 These vehicles will be brought closer to a Zorbfloater, dropped nearby and ,if these vehicles hit other units or obstacles in the process, they will be destroyed in the process. Rapidly heals itself when taking damage. Can lift all of Tier 1, Tier 2 and some Tier 3 units. Cannot lift enemy vehicles from inside of a transport. Can't lift any special units, naval units or amphibious transports. This unit is unique to Last Bastion. Just like the Zorbtrotter is Coronia's choice for advanced anti-infantry engagement, the Last Bastion relies on heavy troops as well for advanced anti-aircraft combat, once the Nanofiber Loom gets an Expansion of its own. The Giantsbane has been designed with one goal in mind: to defend. Just like the Lancers, these soldiers have cybernetic limbs, which instead of giving it speed, give it strength to carry a heavy but incredibly sturdy armor and two large 'Golden Rocket' launchers comparable to those carried by the Teratron or Sweepers, with one difference: Giantsbane can target both air and ground objects. The multilayered construction of the nanofiber-enhanced armor gave the Giantsbane the fame of being the toughest soldier on the battlefield, exceeding in durability even the likes of some of the finest Soviet cyborg prototypes. There is an additional piece of equipment within the Giantsbane armor, which has surprised many unexpecting soldiers and led to their downfall: a stun beam with a range longer than that of the Clairvoyant. Giantsbanes can instantly trap enemy troops, meaning that even for a hero, a one-on-one combat against a Giantsbane might end unfortunately. Takes 3 slots in a transport. Immune to Dog and Spook attacks. Its firepower can be enhanced by 15% near a deployed SODAR Array. With the rich infusion of nanofibers, the Giantsbane sacrifices a bit of its armor in order to create a much more powerful weapon than it had before. Two additional cannons, which make it look as if it had four arms, appear on the sides of the soldier's torso and the weapons they possess are experimental weaponized nanofiber launchers. These weapons pierce through enemy armor and structures with incredible speed like a knife through butter and are virtually unavoidable. Just as the original form was said to be able to defeat giants, the transformed soldier is capable of scaring away the gods themselves, thus the codename Godsbane was chosen for him. These commandoes work for Haihead. Within the ruins of the lost world, an unexpected event has occurred: one of the scouting parties found a pair of survivors, teenage siblings who have not yet been corrupted by the mind control. A brother and sister have been found in a state of almost complete exhaustion and it was later said that mere hours of delay would have caused their demise. After their recovery, the two would begin to value the precious time they've been given, figuratively and literally. Taken to the Bastion's site they've begun their training using the place's unique condition and during the few short years, they've acquired much more experience than the average soldier could in the same period during the old times. It is said that among all the residents of the Last Bastion, these two understood best how important the time given to them is the most and made the best use of it. Alize and Fin have given themselves a mission of their own: together they march forward to eliminate any signs of threat on the path of the Haihead's counter attack. Alize uses a blast rifle which relies on similar technology that is used to manipulate the superpowered steam coming from the trenches connected to the Blast Furnace. These blasts released at high pressure can blow up enemy vehicles and tanks in a matter of seconds. On the other hand, Fin has mastered the use of a custom automated sniper rifle, with which he can kill multiple enemy troops at great ranges in short intervals. The weapon has to reload after a series of shots, but even then Fin can kill to some extent. On the battlefield, Alize and Fin are inseperably fighting side by side. A unique nanotechnology design has been created to allow them to support each other. As long as the siblings are close, they will heal each other and be able to withstand quite an amount of damage. Each take 2 slots in a transport. Cannot fire from inside a transport. Alize can damage units inside Tank Bunkers. Heal each other rapidly if they stay close. This commando works for Wings of Coronia. The marvelous Coronian heroine Eureka has appeared out of nowhere, and within a few short days of combat she has established her position on the battlefield. Whenever she approaches a tank division, its commanders immediately give orders to retreat and try to contact the nearest air force squadron available nearby. Eureka's destructive weapon lays waste to ground forces and its blinding green flash of light is quite often the last thing a soldier sees in his life. The hefty amount of equipment Eureka carries around allows her to create wide and powerful shockwaves which, when charged, will launch towards the enemies and sweep them from the ground. Lightly armored units will most likely not survive it, while the heavier ones and infantry will be massively damaged in the process. Because of the sheer power of this weapon and being difficult to control, Eureka usually fights alone, away from her companions, as one inaccurate shockwave could do more bad than good for the Wings of Coronia. However, if she wills it, she can quickly return to them using a nifty trick - Eureka's boots are equipped with miniature windspin engines that allow her to benefit from the speed boosts which can be provided with the Spinblade. This commando works for Last Bastion. Because of his appearance and immensity, Uragan has once been christiened as the guardian spirit of the Last Bastion base. 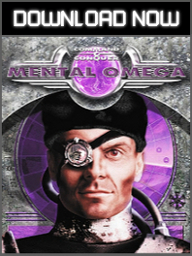 Even though he looks and sounds menacing, Uragan is a young sub-routine of the long-established VOLKNET A.I. that runs most of the Last Bastion's intelligence and security systems and has actually been created at the very last phase of the Bastion base's creation. While Foehn's mechanized units, which rely on plasma weaponry, require large amounts of advanced apparatus to make the weapons themselves work effectively, if not at all, Uragan's entire body has been designed with the sole purpose of generating multiple powerful projectiles without much delay. These projectiles are very effective against all sorts of targets, including aircraft, however they deal the most damage to structures. The Last Bastion does not have a true artillery weapon, which is why they employ several different options to deal with enemy settlements, Uragan being one of the more effective ones. He is slow, but sturdy enough to withstand plenty of enemy anti-aircraft fire.